Burmese women feel great pride when they are asked to explain the golden paste covering their faces. This traditional skin conditioner has been used in Burmese society for centuries and is a cherished part of the national identity. Fragrant thanaka is truly a Burmese household tradition. Every day, after taking a bath, women, children and even some men paint thanaka on their faces. Burmese people believe that thanaka bark cools their skin, tightens the pores and controls oiliness. Women apply this cream in a variety of ways ranging from a casual smear to elaborate patterns, as a light coating or a thick mask. Especially those who work in paddy fields or toil outside for long periods of time will use thanaka as a protective shield on their exposed faces and arms, believing it protects their skin against the unforgiving tropical sunshine. But wearing thanaka is also a centuries-old method of female Burmese beautification. 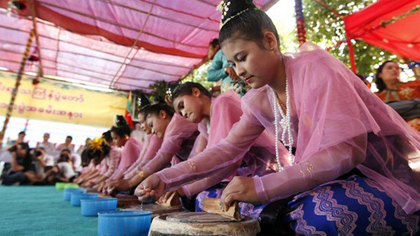 Some women writers talk up thanaka as a traditional Burmese beauty secret. “Thanaka liquid has the properties of making the skin cool and smooth, having a refreshing and chilled fragrance, beautifying the users. It also cures pimples and acne,” notes researcher May May Aung in an online article. Thanaka is made from the bark of a tree that has numerous uses. Thanaka wood is found in handicrafts such as combs, boxes and other small trinkets, and the tree’s roots are used as an “indigenous laxative,” according to May May Aung. Traditionally, Burmese women grind the bark of the thanaka tree with a little water on a flat, circular stone called a kyauk pyin. This produces a milky yellow liquid that dries quickly when applied to the skin, forming a powdery protective covering. The history of thanaka may date back to the earliest development of the country. Some believe that the legendary queen of Peikthano, an ancient Pyu city that flourished more than 2,000 years ago, was a lover of thanaka. According to historians, the Pyu people intermarried with Sino-Tibetan migrants who later became part of the Bamar (Burman) ethnicity. The earliest written reference to thanaka in Burma is in a 14th century poem written by a consort of King Razadarit (or Rajadhirat), the monarch who successfully reunified all three Mon-speaking regions of southern Burma. He ruled from 1384 to 1422 and fended off major assaults by the Burmese-speaking northern Kingdom of Ava (Innwa). According to the authoritative book Myanma Thanaka, written by Thar Hla in 1974, the revered novice monk and poet Shin Maha Ratthasara, who lived from 1486 to 1529, also referred to thanaka in his work. Further evidence of the antiquity of thanaka came following the destruction of the Shwemadaw Pagoda in Pegu, an ancient city located 76 km (47 miles) northeast of Rangoon, in the earthquake of 1930. Amongst the ruins was found a kyauk pyin used by Princess Razadatukalya. She was the eldest daughter of King Bayintnaung, who assembled the largest empire in the history of Southeast Asia and reigned from 1551 to 1581. The valuable antique stone was later donated to the pagoda. Nowadays, thanks to modern scientific methods, thanaka is available as either a thick cream or a powder, making it easier to use. There are at least 200 brands in Nyaungbinlay Plaza, one of the biggest consumer markets in Rangoon. The best-selling brands are Shwepyinan, Shwebo Minthamee, Daw Thi, Taunggyi Maukmae, Natmimae, Phoe Wa, Papawaddy, Sanda and Sauntawku. Traders who sell thanaka estimate that daily sales of the bark paste are worth many millions of kyat. They also say that many of the thanaka products sold in the market lack the official Ministry of Health stamp of approval. Vendors claim that while user-friendly cosmetic products are more convenient, many Burmese women remain loyal to the traditional organic thanaka that has been used for generations because of concerns about the level of purity in the newer products. “Organic thanaka is more expensive, but it really gives you a cooling sensation and protects your skin from arid weather. Ready-made versions are cheap but I’ve heard they are mixed up with soil, so I wouldn’t dare to use them,” said Aye Mya Kyi, a retailer at Nyaungbinlay Plaza. The scientific name of the thanaka plant is Limonia acidissima. The tall, slow-growing tree is native to South and Southeast Asia and can grow on dry, rocky soil in areas without plentiful water. While other nations use its bark, leaves, root, fruits and gum for medicinal and other purposes, only the Burmese wear thanaka as a daily cosmetic and skin conditioner. Burmese people believe that the best thanaka plants are naturally slow-growing, taking three to 10 years for the trunk to reach two inches in diameter. There was not Burmese Grils!!! And also not Thankha grindng competition at all. It was Rakhine Tradition and it was call "Nant Thar Thwe Pwe" to offering Buddha during Thingyan Festival. was competition for "thanakhar Grinding" ? What a great, illuminating article!We are very proud to see our beautiful ladies in beautiful Burmese national costume. Thanaka can cure eczema and restore natural skin colour where there was a burn. A pro-Burmese monarchy Englishman was trying to import thanaka into EU but not enough quantity was available to make the venture viable. "The ugliest young women in present day Burma are the Singapore educated rich young women, with professional smiles (sometimes beautiful faces) fashionable clothes, and hairstyles, eating in expensive restaurants w...you are not looking!" is SPOT ON!THANK YOU KERRY. These women are shameful.They think they class. Not at all. A peasant girl is higher than them. We are proud of our cluture, our dignity and traditional values.The picture really warms our hearts. (2) Plus The second mistake with this photo is it is NOT Thanaka Grinding. Rhakhine do not do Thanaka Grinding during the Thingyan Festival. They grind "Nanthar" on the eve of Thingyan Festival for the Buddha. (3) And the last of all it is not competition. It may be a mistake by Reuters about description of the photo, but you as a writer of this article or you as the editor of this article should have caught this mistake and should use the correct photo for the article. Burmese women are very beautiful, and have great grace. Thanaka is beautiful and unique. But many women (and men) are not safe in your tortured country. The ugliest young women in present day Burma are the Singapore educated rich young women, with professional smiles (sometimes beautiful faces) fashionable clothes, and hairstyles, eating in expensive restaurants with their bored looking friends...or the 'Paris Hilton' wannabes driving around such a poor country in sporty cars and big sunglasses. They are the gross ones. Your sisters are in great pain, and you are not looking! For every women who is raped, forced into labor, or used to build roads for those in control, I send you love and prayer for your freedom. For every brave woman in (or visiting) prisons I send you my deepest respect. For 'pretty' young Myanmar woman attending expensive schools overseas, flying on tourist planes, and with shopping bags and bank accounts in Singapore, I send you sympathy - for your family's karma.